It's undoubtedly one of the smoothest Android phones currently available, though achieves this partly by refraining from adding anything of its own. Addition by subtraction is really the theme encapsulating this device, which will surely please those looking for it. 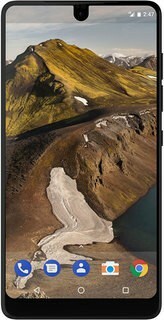 I would definitely recommend the Essential Phone to anyone looking for a well-built flagship, especially an Android purist. As long as photography isn’t your top priority, there’s a lot to like with Rubin’s first effort. If we're not grading on a curve, the Essential Phone's camera, screen, water resistance, and the lack of memory expansion can't compete with other flagship Android phones. If you're pricing a phone at $700, you need to compete with the other $700 phones, and Essential's first phone just can't do that. It's hard to see anyone buying an Essential Phone after looking at the competition. The Essential phone is a beautifully crafted piece of technology. Despite the bugs, the device feels really, really good in the hand. The phone’s design works. The screen’s design works too, regardless of concerns one might have had with the front facing camera placement. Unfortunately, that is where the allure begins, and ends. The Essential Phone is an impressive piece of hardware, and the company deserves kudos for that. Essential built a device with materials that set it apart from the competition, and one that many established smartphone makers would probably struggle to build. Yes, it's a little heavy and basic-looking, but the titanium/ceramic chassis feels durable and different than every other phone out there. I don't like that there's no headphone jack, but this is a battle we're going to lose. At least Essential includes an adapter. Visit the Essential Q&A Forum to get answers, ask a question or help others.